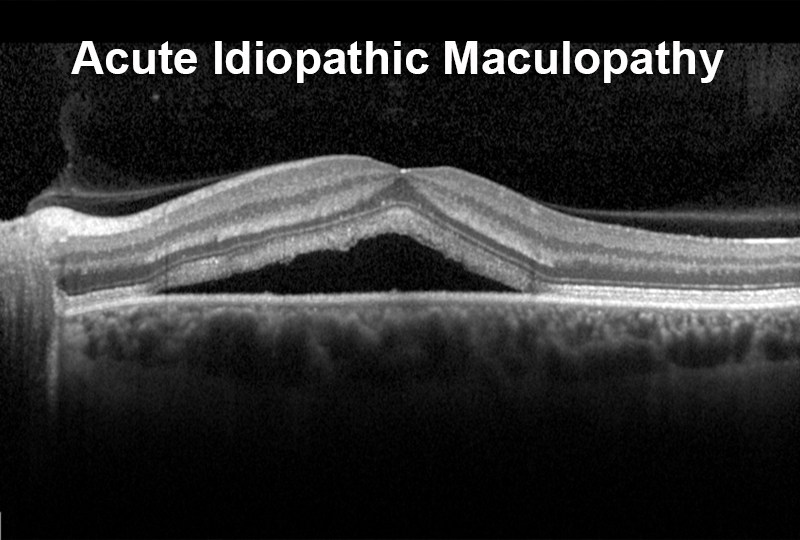 Unilateral acute idiopathic maculopathy (UAIM) is a rare macular disease described in 1991. People with AIM present with sudden and severe unilateral visual loss, often following a flulike illness. 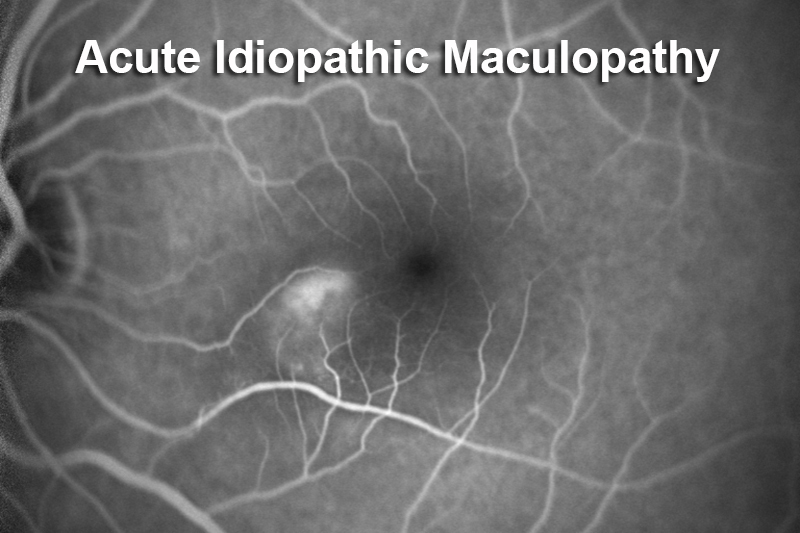 The reduced vision was due to a greyish thickening of the RPE in the macular area, associated with an overlying exudative neurosensory retinal detachment and sometimes few intraretinal haemorrhages, papillitis and/or vitreous cells. The natural course of AIM is a spontaneous recovery over a period of several weeks to months. The cause is likely viral and recently has been attributed to Coxsackie virus. Notice that there is subretinal fluid but the choroid is NOT thick. 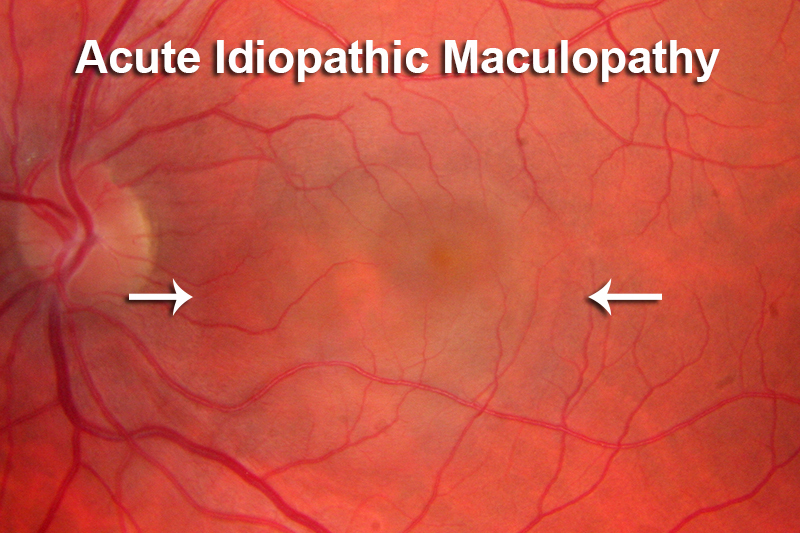 A thick choroid is seen in people with central serous retinopathy which is much more common than acute idiopathic maculopathy. 44 year old man One week ago the left eye was running non-stop and it burned and he had to pry the eye open. Then the vision started to decline three days ago. When he closes the right eye to look at something bright he cannot read. He had a chest infection started about 2-3 weeks ago. He saw a doctor 4 days ago. He was started on an antibiotic but has not started it yet. He did sore on the right side of his mouth with the infection and he did not have any rashes. He does not have exposure to little kids. VA 20/25 OD, 20/200 OS. Serous retinal detachment in the macula OS. Patient was hospitalized for mental status change. He had very high blood alcohol level. MRI was negative as was spinal tap checked for Cocsackie virus and Syphillis. Blood titers were high for Cocksackie virus but no acute infection was verified. The FA in this patient showed leakage at the level of the RPE with no defined neovascular membrane. This patient recovered normal vision within about 1 month of the onset of the symptoms. An ICG was also done which showed no vascular network.